The workspaces and data used in the tutorial are available for download from GitHub. Subscribing to topics is a nice start, but doesn’t utilize FME’s core competency of spatial data handling. In most cases subscriptions will have a set of business rules that determine when the a device/user will notified, which in our case will be spatial in nature. The most basic rule is a test to see if an incoming message is located within a geofence. To avoid confusion over which notifications are coming from which workspace, open the Web User Interface and remove the 1_processs_messages.fmw workspace. 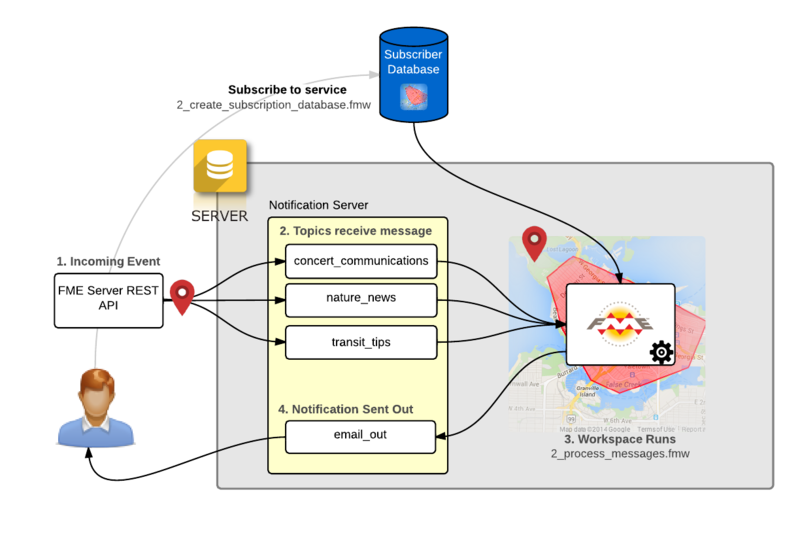 You could alternatively remove the subscription in the Notification > Subscription page, leaving the workspace on FME Server. Modify the PostGIS writer’s connection parameters to match your PostGIS database. Open the AttributeCreator transformers and change the email addresses to your own email address. For testing purposes, use the +keyword notations to make the email addresses look unique in your email client (e.g. fmeserver+transit@gmail.com). Run the workspace to create a table called subscription_database. This creates a spatial database with three different email addresses subscribed to three different topics in specific geographic regions (in this case different continents). Again, manually editing this database is easy enough for static or low numbers of subscriptions. Note the VertexCreator and CoordinateSystem transformers that convert the textual representation of the messages location into a native FME geometry. Open the FeatureReader transformer and modify the PostGIS reader’s connection parameters to match your PostGIS database. The FeatureReader is like the Joiner, except it also tests spatial relationships. check the database to see which email addresses are subscribed to both the topic the message was received from AND the area where the message is located. send an email notification to the subscribed email addresses. Click the Try it out! button. You will prompted to login if you haven’t already. afterwards click Try it out! again. You should receive an email to the address you specified for the nature_news topic back when you created the database. Since there is no subscription to both the nature_news topic AND an area that covers Canada, no notification will be sent. Now you have a created a simple system for managing subscriptions to topics and geographic areas using a database.